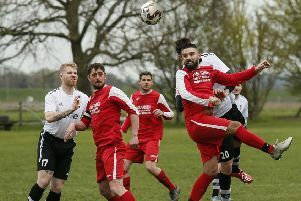 Totternhoe progressed into the quarter-finals of the Bedfordshire Senior Trophy with a 3-2 victory over SSML Division One side Bedford FC on Saturday. The visitors came into the the game on a good run of form, winning their three previous league games, but it was Totternhoe who began in control. However, they fell behind on 25 minutes though when against the run of play, Jack Downes latched on to a long ball to fire past Louis Bowley. The second period saw Totts on the front foot and they were level just past the hour mark when Mitch Brent threaded an inch perfect pass through to the impressive Joe Smith who curled a wonderful effort into the net from the edge of the box. The home side then won a penalty on 75 minutes when Smith was pulled to the ground, but Scott Murchie saw his effort hit the post. Bedford were back in front with 10 minutes to go when a corner fell to Downes on the edge of the box and he fired through the crowd to make it 2-1. The goal sparked a change in personnel from boss Chris Robson as Joel McCormick was introduced for Murchie and the substitute immediately linked well with Aidan Murray whose teasing cross was converted by Ash Farmer. Deep into injury time the Totts won it when a Farmer corner was met by Jack Lauder at the back post who headed it back across goal for Wayne O’Connor to send his side into the quarter-finals. Speaking afterwards, Robson said: “It’s a very pleasing win and performance. “I asked the players to continue where they left off after last weeks unbelievable display at Tring as we knew today would be a lot tougher playing a team in good form from a level above. “We were always confident in our ability and wanted to take the game to them and let them worry about us. “I felt the score makes the game seem more close than it actually was as we conceded two sloppy goals from mistakes, but apart from that I didn’t think Bedford troubled us much. “We could have had a few more than three, as we missed a penalty and only some great saves from their keeper stopped it from being a lot more comfortable. “It was a great effort from the players as not only did they show good quality in possession, out of possession we worked so hard and did everything we have worked on in training. Totts: Bowley, O’Connor, Lauder, Rimmer (Irons), Murchie (McCormick), Bishop (Hibbitt), Brent, Golding, Murray, Farmer, Smith. Subs not used: Bromhall, Loasby.